No jets in the Galactic center? Figure 1: Artist's impression of the high-energy emission from the Fermi bubbles. Credit: NASA/Goddard Space Flight Center. In 2010, astronomers discovered something phenomenal in the center of our Milky Way. 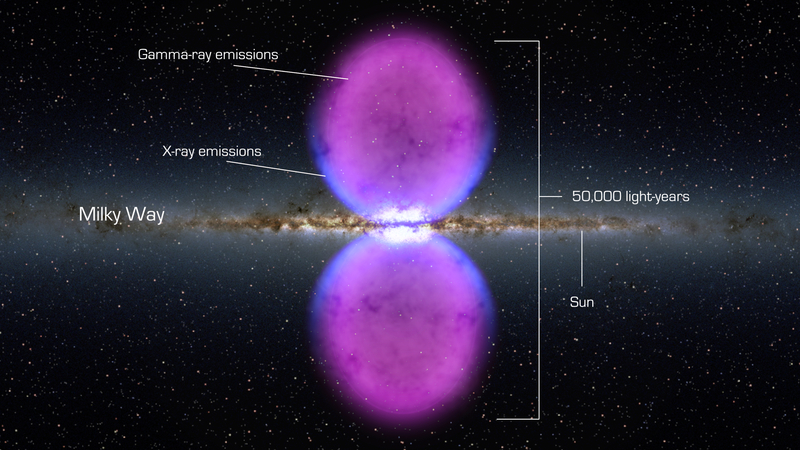 Two huge bubbles of γ-ray emission–now known as the Fermi Bubbles (for the telescope that detected them)–balloon out of the Galactic center, extending 25,000 light years above and below the Galactic disk. What created these giant structures? We don’t know the answer yet, but most astronomers think it falls into one of two main categories: jets or star formation. Option 1: Our supermassive black hole was once active. All large galaxies contain supermassive black holes at their centers, and the Milky Way is no exception. A fraction of these supermassive black holes are the engines that power active galactic nuclei (AGN): tremendous amounts of energy, often in the form of jets, expelled when the supermassive black hole consumes gas from a disk surrounding it. Although we don’t see jets from our supermassive black hole today, it could have had them at one point, for instance, if it had a really large snack on some stars or gas. The jets could have propelled a tremendous amount of energy into the ambient material near the Galactic center, thus blowing the bubbles we observe. 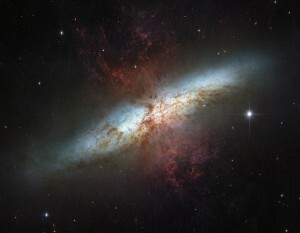 Figure 2: Hubble Space Telescope image of galactic-scale winds in M82, the cigar galaxy. Option 2: Star formation. Lots of star formation. Whenever stars are actively forming, exciting things happen. Core-collapse supernovae are impressive explosions that result from the deaths of the most massive stars, but these stars only live for a short time. (Massive stars are the sports cars of the Universe: they take tons of fuel and burn through it very quickly.) If many supernovae explode near each other, the supernova shock waves can break out of the gas and dust in the galactic disk. We see such galactic winds on large scales in galaxies like M82 (Figure 2). If enough star formation is concentrated near the Galactic center, supernova winds could create the Fermi bubbles as well. The case for star formation. While it is difficult to rule out jets, astronomers have found evidence to support the star formation scenario. First off, stars are indeed forming near the Galactic center. However, we see much less radio emission in the star-forming locations than we would expect based on observations in other wavelengths. We expect to see a lot of radio emission in a region of active star formation because shock waves from supernovae accelerate electrons to extreme speeds, and as these electrons–known as cosmic rays–interact with the magnetic field of the former star, they emit radio photons. In the bubble scenario, supernovae would go off all the time, but unlike in isolated star forming regions, if the supernova winds travel up into the bubbles, the cosmic rays can too. When the cosmic rays eventually emit photons, many would be far away from the star-forming regions targeted by previous studies. 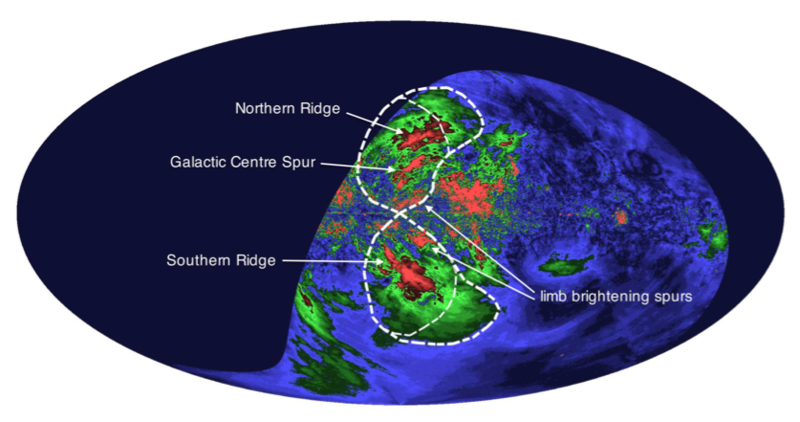 Carretti and collaborators observed the whole Fermi bubble region, and found that the bubbles are filled with polarized radio emission, consistent with a cosmic ray origin. What’s more, the width of the bubbles is strikingly similar to the size of a ring of star formation around the Galactic center. Models show that the wind from this region would be strong enough to propel the cosmic rays all the way to the edge of the bubbles, even though the cosmic rays will radiate energy in the form of photons and must fight against the gravitational pull of the Milky Way’s disk. The radio emission map supports this idea, revealing that the cosmic rays lose energy as they travel away from the Galactic plane. Figure 3: A map of the radio intensity of the Fermi bubbles. Dashed lines show the extent of the γ-ray emission. Interestingly, the radio emission is not uniform throughout the bubbles. Instead, there are three bright streaks within them: the “Galactic Spur”, and the northern and southern “Ridges” (Figure 3). The authors suggest that the streaks show the history of star formation in a piece of the ring, like geological layers in rock. These streaks spiral upward, stirred by the galaxy spinning under them. Some studies have speculated that the “Galactic Spur” is actually a jet. But the same cosmic rays that produce the newly detected radio emission could work overtime and create γ-rays when they collide with lower energy photons, explaining the whole feature with supernova winds alone. Have we solved the Fermi bubble mystery? Partially. We would still need multiple outbursts of star formation to explain the total energy of the bubbles, and this extra energy could come from jets. In either case, star formation does play a role in forming the bubbles. The strong supernova winds might even explain why our supermassive black hole is so quiescent: most of its potential fuel makes stars and is blown away by supernova winds before it making to the true Galactic center. Thus, while the Galactic center obtains plenty of material to make stars, it may not provide much fuel to the starving black hole at its heart.